Paper Thickness/Weight: 1.6 - 7.9 mils / 5 - 42 lbs. PPM specifications can sometimes be misleading, but the true production speed is a combination of scanner speed, on-board processing, the connected PC, and the software delivering the scan to its destination. 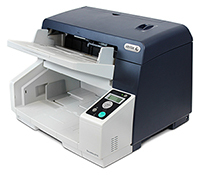 The DocuMate 6710’s 100 ppm / 200 ipm speed is just the start of the story. Visioneer’s On-Board Acuity technology handles 15 image enhancements in hardware, saving PC processing time. A true native USB 3.0 connection delivers a fast pipeline. Finishing off the job, Visioneer Acuity detects the available memory and processing power of the connected PC and uses multi-thread, multi-core logic to ensure that the PC itself isn’t the bottleneck. The result: scan speeds as advertised. For more information on technical features, please see the Product Brochure. To keep any scanner operating properly, certain maintenance should be performed at different stages in the life of the product. Our Customer Service Department is here to help if you have questions. If you know already know what you are looking for, you can find the parts, accessories, and replacement DVDs right here.